Tomato and capsicum seedlings have gone back into our nearest raised beds this spring, after all the solanums rotated for the past couple of years to far-flung parts of the garden in the interests of pest management. Some extra tomato seed and basil seed is in here too. The tomatoes have a temporary mesh ‘fence’ to grow on, while in the adjacent bed I’ve used the same approach for climbing beans. As this bed faces north-west and cops the worst of the summer sun, the scarlet runners are intended to climb up and give the rest of the bed a bit of afternoon shade. Salad greens will have their summer in the vertical garden under shadecloth, with only a few hours of sun, and with plenty of established plants around them to keep the humidity up. In Adelaide pumpkins, zucchini, button squash and melons are ready to be planted out in ‘sprawling’ parts of the garden, where they can’t smother other vegies but can gain a bit of afternoon shade from fruit trees. Worms may need to be shifted to avoid hot sun as it sneaks through in places it couldn’t reach during winter. Mulch needs topping up, and irrigation systems need checking and flushing to be in prime working order for summer – and especially for holiday absences. Mulberry, pear and apple trees are now putting on new growth. My ‘rocks in socks’ have been refilled and rearranged, weighing down apple branches in order to maximise the growth of new fruiting spurs. Espaliered trees have also been tip pruned and need some new wires to train their whippy stems towards the horizontal. Leaf curl has only been a real concern on one of the stone fruit trees, and it’s still carrying quite a load of fruit while regrowing much of its foliage, so these fruit may need to be thinned. 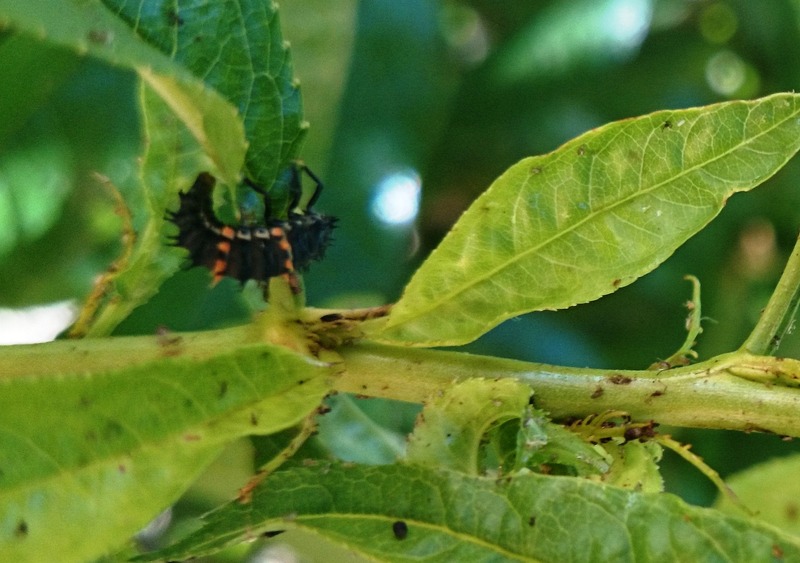 A peach tree in the nearby child care centre’s garden was smothered in aphids, which attracted the biggest crop of ladybird nymphs I’ve ever seen – two weeks of solid munching and the aphids are just about history, while the tree is still going strong. Rampant native ground covers and shrubs, trimmed from the road verge and finely chopped, + paper from spring cleaning of the house and sheds + a spring racing-fed manure bonanza = potent, speedy compost advertising itself to all the dogs passing by! When mature, this will go back to zones 1, 2 and 3 as the vegies get hungry. Hot, dry early spring weather combined with increased fuel loads have led to the fire danger season being declared early in four of SA’s districts. There are also reports of more native animals than usual turning up at this time of year in the Adelaide suburbs, perhaps looking for water. While we hear that half the world’s wild animals have disappeared in my lifetime (and I’m not that old), we cut back funding for Landcare and watch more of their habitat disappear instead of being rehabilitated. Have we forgotten that all life depends on Earth’s wild places? This entry was posted in fruit, native plants, permaculture design, permaculture principles, planning, planting, raised garden beds, spring, vegetables, vertical gardens, water, zones. Bookmark the permalink.